Nikolaj Busk Jakobsen leads the way for Panthers in heat five. Furious promoter Ged Rathbone accused his Peterborough Panthers riders of a lack of professionalism following a first defeat of the season last night (April 8). 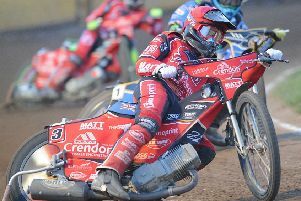 The city racers slumped to a 49-44 loss at the hands of Sheffield at the East of England Showground as the visitors took control of the Midland Group in the Premier League Cup. Ulrich Ostergaard out in front in heat six. Panthers trailed from start to finish except for a brief few moments in the lead following a 5-1 from reserves Tom Perry and Emil Grondal in heat two. Nikolaj Busk Jakobsen starred with a 14-point haul boosted by a successful tactical ride – an embarrassing situation for a home team to find themselves in – but five other riders were only able to manage five points or fewer. And Rathbone blasted: “I absolutely hate losing and I’m not taking any prisoners. The lads are professional sportsman and we pay them to do a professional job. “We can’t afford to take two-or-three races to get our bikes going, and some of the riders need to have a look at themselves and their set-ups. “It might be early in the season, but some of them need to make some dramatic changes otherwise the club will have to make some of their own. “This team should be untouchable at home and if we can’t win here, will have to do something about it. From a 38-point victory over Scunthorpe the previous Friday to a five-point defeat last night is a rather quick and worrying nosedive. The latter result was on the cards from an early stage with Panthers riders regularly left trailing from the tapes and seemingly unable to fathom the fastest way around a grippier-than-usual Alwalton track. All too often they were caught dawdling in mid-track as opponents made hay down on the inside or wide by the fence. Busk Jakobsen, who impressed after retiring in his opening ride, and Perry, who was in the thick of the action for his paid six, should be exempt from any criticism. But the remaining members of the Panthers team were all below par. Sheffield, on the other hand, oozed power with six riders managing at least six points or more. Only young reserve Nathan Greaves, who twice hit the deck and once retired, failed to score. Most of the damage was done by the partnership of Kyle Howarth and Josh Bates who produced a hat-trick of 5-1s in their opening three outings. They were already well on top when Busk Jakobsen eased to a halt in heat three and they took full advantage in a seventh heat re-run after Nicklas Porsing had slid into the fence to earn an exclusion in the initial staging. Howarth and Bates then halted a mini-revival from Panthers with another full-house in heat 10 to leave the visitors eight points to the good at two-thirds distance. Busk Jakobsen’s call over the Alwalton airwaves during the interval for Panthers to ‘man up’ presumably went unheard in the pits as the action resumed with another Sheffield maximum courtesy of Simon Stead and Dimitri Berge. A 12-point gap allowed Panthers to deploy Busk Jakobsen for double-points in heat 12. It was a move allowed by referee Chris Gay even though competition rules say the tactical ride is not permitted to be used. The Dane made no mistake but the impact was minimised when Perry found himself pushed wide and lost all momentum when attempting to pass Richard Hall for third. One gain was followed by another though as Ostergaard and Porsing slammed in a 5-1 in heat 13 but any hopes of a fairytale fightback were ended by a man who once starred in the greatest Panthers comeback of all. Hall, one of their Elite League title heroes of 2006, haunted his old club by taking the chequered flag in the penultimate race and inspiring a 4-2 that earned the Tigers victory. Sheffield had to settle for three league points after a finale dominated by Busk Jakobsen although a late swoop from Howarth denied Panthers a 5-1 as he pinched second spot from Ostergaard. But they now boast a six-point cushion over Panthers in the race for top spot in the Midland Group. It makes the city side’s trip to Scunthorpe tomorrow (April 10, 6.30pm) a must-win. PANTHERS: Nikolaj Busk Jakobsen 14, Ulrich Ostergaard 8, Tom Perry 5+1, Michael Palm Toft 5+1, Nicklas Porsing 5+1, Simon Lambert 4, Emil Grondal 3+1. SHEFFIELD: Kyle Howarth 12+1, Jason Garrity 9, Josh Bates 8+2, Dimitri Berge 7+1, Simon Stead 7, Richard Hall 6+1, Nathan Greaves 0.